Frequently Asked Questions and Points of Contact. How long before the trip can I make my booking? In what moment of booking I must enter my membership number Aerolineas Plus? You must do it when you are entering your data. Remember that is the only opportunity you'll have to submit it and that it is necessary when you are making the Web Check In so you can earn miles on your Plus Account. With which ways of payment can I pay my booking on-line? The way of payment accepted in all the websites is the credit card. In the event of Argentina, you will also be able to pay through the “Pago Fácil”, “Pago Mis Cuentas” systems and MasterCard Debit Card. Can I pay my ticket with credit card in installments? Purchases made through the websites for Argentina, Brazil and Chile you can pay in installments with local credit cards. The rest of the websites do not permit to finance the purchases. The minimum amount to access an installment plan is USD 50 or its equivalent at the day’s exchange rate. How can I pay a booking with the "Pago Fácil" system? The payment through the “PAGO FÁCIL” system is available for bookings made through our Website for Argentina and which first flight is seven (7) days after having made the booking. The amount of the bookings to pay through PAGO FÁCIL may not exceed $ 30,000 (Argentine pesos) with the exception of the Correo Argentino network, which accepts payments of up to $ 5,000 (Argentine pesos). Please take into account that this payment method does not offer the possibility of doing it in installments and that the only currency accepted is the Argentine Peso. Please, take into account that this modality of payment does not offer the possibility of doing it in installments and that the only currency accepted are Argentine Pesos. Once you have chosen this option, a written evidence of payment will be generated, which will include all the data related to your booking, also with its amount and the barcode. Then, you will have to print it and go with it to any of our offices for payments authorized for paying through “Pago Fácil” system (http://desa.e-pagofacil.com/espanol/site/donde_pago.php) within the Argentine Territory and within twenty-four (24) hours from the moment of making the booking with the purpose of paying it. Within ninety-six (96) hours of having finished the payment, you will receive an e-mail with the corresponding Written Evidence. It is important to highlight that once the written evidence has expired, both it and the booking will have no validity onwards. Do I receive any written evidence once that I have finished the booking or the payment of the ticket? Once you have made and finished making your booking, you will receive immediately in your mailbox the booking code composed by six (6) letters together with the detailed information related to said booking. Afterwards, and once you have finished the payment process, you will also receive an e-mail with the confirmation of it and the ticket numbers. Can I book some other service through aerolineas.com? Through aerolineas.com, you will also be able to make a booking of a hotel and to rent a car. What is our Aerolíneas Plus Program? Aerolíneas Plus is a program created to give a prize to our clients` fidelity with the possibility of flying with free tickets to national destinations and all over the world, plus a series of additional benefits. To participate you only have to fill in the form and you will obtain a Membership Number as Frequent Flyer with which you will be identified as a member of the Program. The procedure is simple and completely free. Can I fill in the form for being a member of the program through aerolineas.com? Yes, through the inscription form on-line. Can I print my card from the website? Yes, you will be able to print your virtual card with your name, surname, and membership number. To which Aerolíneas Plus services can I have access from the website? How can I obtain my keyword to have access to these services on-line? Purchases made through the websites for Argentina, Brazil and Chile you can pay in installments with local credit cards, Argentina (Visa, MasterCard, American Express, Diners, Tarjeta Naranja, Nativa, Cabal, Argencard, Cencosud) Brasil (Visa, MasterCard, American Express, Diners) Chile (Visa, MasterCard, American Express, Diners, Magna). The rest of the websites do not permit to finance the purchases. Who can be beneficiaries of my account? What data must I enter to start making my Mobile Check-In? You must enter the booking code, the last Name and the name of the passenger. How can I do to appoint the beneficiaries? -Kinship of each beneficiary as regards the holder of the account. That note shall be attached to a photocopy of the holder identity card, not being necessary the copy of the beneficiaries documents. How can I have access to consult about the miles? Please, enter My Plus Account. How can I do to accredit my lacking miles? For Aerolineas Argentinas and Austral flights: ein case you have not advised your membership number before flying, you must log onto the website aerolineas.com, after 7 days of the flight and before 6 months have elapsed; go to the Aerolineas Plus tab, you will find my Plus account, access the account with your member number and password choose option “credit my miles”; and follow the prompts. For SkyTeam flights: If you have not advised your membership number before flying, must mail, original boarding pass coupons (boarding card), copy of the electronic ticket, your membership number and/or ID number and a contact email to Aerolineas Argentinas Aerolineas Plus Rivadavia 578 CP C1002AAP Buenos Aires, Argentina within 6 months of having taken the flight. How can I do to request my booking with Aerolineas Plus miles through the website? Enter My Plus Account and click on the prize booking. Haven´t you find what you were looking for? How can I do to receive the statement of my miles in my e-mail address? You will have to leave your e-mail address registered in the screen of: Aerolíneas Plus / My Plus Account / Registration of the E-mail address for the statement. What can I do if I forget the keyword to access the AR PLUS section through the website? In order to recover your keyword and be able to Access to make requests, please enter the requested data exactly as they have been registered in the Aerolíneas Plus Program of Frequent Flyers and then, go press “Accept”. You will have to complete: Membership Number, Last Name and Name, type of document, Number of document and Birth Date. How can I have access to the conditions for the usage of the Program? Entering the section Aerolíneas Plus – Conditions of Use. What are the associated companies? The associated companies can be airlines, companies to rent a car, tour operator, chains of hotels, bank entities, etc.The associated companies participate in the Aerolíneas Plus Frequent Flyers Program granting you additional benefits at the moment of showing your Aerolíneas Plus Card. Besides, whenever you acquire the product and/or use the services of these companies, you also accumulate miles. Which are the associated companies? The associated companies can be airlines, companies to rent a car, tour operator, chains of hotels, bank entities, etc. How can I access the Usage of Miles Chart? What benefits can the Aerolíneas Plus Platinum Members have? Club Condor Counters, the best treatment at the check-in – VIP Room, all the exclusivity – Priority Boarding – Special Millage by category – Additional Baggage without any charge, more benefits – much more comfort – Up Grade to Club Condor, always more privileges. Which are the differences between Promotional and Tourist Class of Aerolíneas Plus? Promotional Class: It only permits to redeem round trip tickets; it does allow neither changes nor refunds; in case of not being used, the tickets as they have been issued the miles are lost. Tourist Class: It permits to redeem only one way trips tickets; if you wish a round trip ticket you should accumulate up the corresponding miles; it permits changes and refunds with a charge that varies according to the destination. Club Condor Class or Club Economy Class: It permits to redeem only one way tickets; if you wish to redeem a round trip ticket, you should accumulate the corresponding miles; it permits changes and refunds with a charge which may vary according to the destination. Promotional Class with Tourist Class: If in your booking you have a segment in Tourist Class, which permits changes and refunds, at the moment of combining it with a Promotional Class the rule to be applied will be the one corresponding to the Promotional Cass for the whole booking. ¿When will miles of my Aerolíneas Plus account expire? Your account will have 0 (zero) balance when you do not register any air movements in the term of three consecutive 3 (three) years. Thus, this will be understood as no prize ticket from the accreditation of miles for having flown by Aerolíneas Argentinas, Austral or the participating airlines of the Program in valid fares have been issued. The spouse, all first-degree relatives in the ascending and descending line and brothers and sisters who have been named by the holder can be beneficiaries. Said appointment must be written, in the request form to get the Program membership or, may be also by a subsequent communication. In case of minors, the points shall be used by the same minor or by the direct relatives who will have to be included within the kinship already established for beneficiaries and that they may only be nominated and approved by either parents or guardians of the holder to manage their account. A person who without the need of a familiar link, travel with the holder with a prize ticket given by him/her in the same flights which booking and issuance of the ticket is performed jointly with the one of the holder shall be considered a companion. To such effects, only one companion shall be admitted per flight. The cancellation of the holder booking will make the companion booking expire, and only in the case that the ticket restrictions permit the right for refund, it will be possible to request it. The last air movement in my account has been on August, 10th, 2010 and I have no intention to travel by this moment, ¿When do my miles expire? Miles shall expire on August, 31st, 2013. I am the holder of a card and I have 40.000 miles but I will not be able to travel due to labor matters ¿Can my daughter travel to Miami with my miles and avoid the expiration of my account? Yes, you will have to register your daughter as a beneficiary of your account. The issuance of this prize ticket is an air movement which will avoid the expiration. The miles of my account shall expire on September, 30th, 2012 and I am thinking of buying a ticket for travelling later in October of the following year. In case I buy the ticket before September, 30th, 2012, would my miles expire anyway? Yes, because what generates the air movement is the usage of the ticket (the act of “flying”) and not the act of buying it. I am a member through the credit card, we are going to travel with my family and I do not think that my miles will be enough; I have not a certain date to travel yet. Can I buy the lacking miles in my account to avoid expiration? Yes, you can buy the lacking miles and issue your prize ticket simultaneously, before the expiration date of your account. Six months ago I had a credit card which accumulated miles and now I started travelling by Aerolineas Argentinas and I accredited my first flight. Shall the miles I used to have with the credit card expire at the third year of the last movement of the credit card or of the last air movement? I add up my miles obtained by my flights, but it is a long time that I cannot travel and my miles will expire on September, 30th, In case I rent an Avis car before that date, shall be the expiration of those miles avoided? No, only the air movements are taken into account, being understood for such expression all the air movements both the issuance of a ticket and the accreditation of miles for flights acquired with valid fares. Aerolineas Argentinas / Austral allow passengers with reduced mobility to carry their wheelchair at no additional cost. Remember that if you are traveling with your own wheelchair, Aerolineas Argentinas / Austral will provide a courtesy wheelchair assistance service. This service allows to take the passenger from the check-in area to the aircraft and from the aircraft to the arrivals area. Wheelchairs are carried as checked baggage ONLY. Aerolineas Argentinas / Austral DO NOT carry wheelchairs powered by spillable or lithium batteries. NON-SPILLABLE batteries are those identified by one of the following "key words". In case your battery does not have any of these "key words", you should consider your battery as SPILLABLE. Aerolineas Argentinas / Austral DO NOT carry wheelchairs powered by SPILLABLE BATTERIES as baggage. You can only check the wheelchair in without its battery. SPILLABLE BATTERIES can only be carried as CARGO. For domestic flights please contact e-mail: jetpaq@aerolineas.com.ar or Tel + 54-11-4130-4000 and, for international flights contact e-mail: aerolineascargo@aerolineas.com or Tel + 54-11-4480-6396 / 6264. Aerolineas Argentinas / Austral DO NOT CARRY wheelchairs powered by LITHIUM BATTERIES as baggage. You can only check the wheelchair in without its battery. Once your flight is booked, you should immediately contact the Company at 0810-222-VOLAR, in order to plan your trip to avoid any unforeseen event at the airport. We recommend you inform us at least 48 hours before starting your trip, on the type of wheelchair you wish to carry. In case of transfer to another airline, you should contact that company and see the transport conditions for your wheelchair. Please remember that on the day of the flight you must be at the airport 120 minutes before the departure of your domestic flight and 180 minutes before the departure of your regional or international flight. It is important that you consider that the staff of Aerolineas Argentinas must visually check your battery to confirm that it is suitable for transport by air. If it were necessary to disassemble any part of the chair, we ask you to come to the airport provided with the necessary tools to do it. Non-spillable battery powered rigid or folding wheelchairs will be carried as checked baggage provided that the battery is perfectly placed in the wheelchair, it is disconnected and its terminals are insulated to prevent short circuits or any accidental operation of the chair. "Manual" wheelchairs will also be checked-in as checked baggage. Obviously, we will take all necessary precautions to avoid damage on the equipment carried. However, we recommend to keep in your carry-on baggage all items that could get lost such as cushion, footrest, anti-eschar cushions, among others. As a general rule, all types of electric and/or manual wheelchairs must be carried as checked baggage. Therefore, you must know that you will not be able to retrieve your wheelchair during a long connection or immediately after getting off the plane. The wheelchair will be returned to you at the arrivals hall. It is the responsibility of the airport operators to assist any person with a disability during the time spent in the terminal, from its arrival until its departure, including intellectual disabilities and other impairments such as age or any other cause of limitation. Airlines may provide the airport operator with information in advance for a proper service provision. For your request to arrive on time, contact us at least 48 hours before the flight. Aerolíneas Argentinas/Austral has wheelchairs available to facilitate the transfer and movement of passengers with disabilities, who may travel alone or with an able accompanying person, depending on the degree of their disabilities. They must be requested when booking at least 24 hours in advance. The acting staff, if necessary, will provide the passenger with a wheelchair for this type of passengers to move within the airport. In addition, if circumstances so require and if the airport has the means, a lift to access the aircraft may be used. My domestic flight is very short. What services will be offered on-board? If your flight lasts up to 1 hour 25 minutes, no snack or drink service will be offered; only water upon request. If your flight lasts more than 2 hours, a drink and snack service is offered. In case you wish a meal which has to fulfil special requirements because of being on a special diet or because of religious reasons, you should have to request it at the moment you are making the booking at least 72 hours in advance. In this case, please notify the cabin crew before the meal service time. All the meats which are offered in our flights have passed through the corresponding rigorous controls. For more information, please contact us Special Services. If you are planning to travel from Argentina to U.S.A., Mexico, Spain, Italy, Bolivia, Colombia or Australia, take into account that you will have to inform your passport number, nationality and date of birth at the moment of making your reservation in order to speed up the migratory procedures at destination. Inbound and Outbound with identity cards issued in their respective countries as travel documents in replacement of the passports is permitted for all the citizens who belong to the MERCOSUR State Members (Argentina - Uruguay - Paraguay – Brazil). The same rule is in force for the States Associated to the Mercosur Ex: Chile, Bolivia, Colombia, Venezuela, Peru and Ecuador. Passengers arriving in Montevideo that have a connecting flight with another company that exceeds 24 hours will not be considered “in transit” and must complete the Immigration and Customs procedures, as well as the corresponding payment of airport tax, and collect the baggage and take it to the other company. In case you travel to Europe and uses our services, please take into account that those passengers that have as a destination, or a stop, stopover or connexion in more than a SCHENGEN STATE for which they may need a visa, they will have to travel with a MULTIPLE VISA. The Schengen State, according to what is stated by the rule, is composed by the following countries: Germany-Austria-Belgium-Denmark-Spain-Finland-France-Greece-Holland-Island-Italy-Luxemburg-Norway-Portugal, Sweden, Slovenia, Slovakia, Hungary, Latvia, Lithuania, Malta, Poland y Czech Republic. Those mentioned States have endorsed to an agreement that was in force from March, 1995, agreeing to create a community territory without borders known as Schengen area, in which national that apply to the covenant of the Schengen Agreement are permitted to cross interior frontiers of said territory without being necessary to carry out any migratory control at all. For that purpose the procedures in the migratory controls have been standardized and the visa policies of all the member states have been harmonized, agreeing the issuance of a visa in common for all the party states called VISA SCHENGEN. They will have to show a valid passport and comply with the entrance requisites requested by the country authorities. Once they have complied with those control proceedings of entrance, they will be able to transit all throughout the schengen territory. Observation: The officer of migratory controls in the entrance border post, has the legal authority of requesting the passenger to show, apart from the passport and its updated visa, the documentation which evidences his/her financial situation, the time he/she will stay in the schengen territory, the purpose of his/her trip and the return ticket. Viewing this documentation, the migrations officer, has the legal authority of denying the entry in schengen territory even with a valid visa. They will have to show valid Schengen passport and visa of numerous entrances and they also will have to comply with the requisites of entrance requested by the authorities of the country. Once the entrance controls procedures have been fulfilled, they will be able to transit within the Schengen territory. It is worthy to clarify that each airport has different operations or characteristics to apply in the same way the regulation mentioned. Madrid: at this airport, those passengers that require Schengen visa and have already made their entrance to the Schengen territory but will continue their trip by any Aerolíneas Argentina’s flight, will have to make the corresponding migratory procedures again for departure from the Schengen territory and, at the destination, they will have also to make all those migratory procedures of entrance again as if they were coming from third states. That is the reason why, it is very important that they have a Schengen visa with multiple entrances. According to the EU Regulation N ° 610/2013 of the European Parliament and of the Council, art. 5, which modifies the conditions of entry of third world country nationals, establishes that to enter the State of Schengen countries, travel documents (passports) of passengers with tickets issued starting July 19, 2013 must be valid for three (3) months after the expected date of departure from the territory of the Member States. In addition, the documents must have been issued within the previous 10 years. Upon arrival, border Control will evaluate the cases in which the document does not comply with the new requirement of validity. This regulation applies to all nationalities, except for nationals of countries of the Schengen State and the European Union (Germany, Austria, Bulgaria, Belgium, Cyprus, Croatia, Denmark, Spain, Slovakia, Slovenia, Estonia, Finland, France, Greece, Hungary, Iceland, Italy, Ireland, Latvia, Lechtenstein, Lithuania, Luxembourg, Malta, United Kingdom, Rep. Czech, Netherlands, Poland, Norway, Portugal, Sweden, Switzerland, Romania). Note: An schengen visa permits the traveller to enter and travel throughout the schengen territory, but it does not give him/her an automatic right to it. The Migratory Control officer in the border post at the entrance has the legal authority of requesting the traveller to show, apart from his/her valid passport and visa, the documentation that may evidence his/her financial situation, of the time of permanency in schengen territory, of the purpose of his/her trip and of the return ticket. In viewing this documentation, the Migratory Officer, will have the legal authority of denying him/her the entry to the schengen territory, even with a valid visa. For all the cases of passengers in transit conditions between Schengen country members, they will have to verify the visa requirements particularly for each situation. Now you can get your application to enter Australia through Aerolíneas Argentinas. Thus, you may obtain what the Australian government calls an ETA (Electronic Travel Authority), that is to say, a Travel Electronic Authorization, that is equivalent to a Visa of Tourism, but does not require of sealed or rubber stamping of your passport, nor concurring to the Australian diplomatic representation to request it. La ETA can be requested electronically through the Aerolíneas Argentinas computerized system that is connected with the Australian Department of Immigration and Multicultural and Indigenous Affairs (DIMIA). Whenever you reach the airport to make your check-in for a flight to Australia, Aerolineas Argentinas counter staff can confirm directly your authorization to board it. Important: Remember to complete full passport number (alphanumeric) in their electronic visa formalities. - Require it with a minimum time in advance of twenty-four hours before departure of the flight. - To have the passport of some of the following countries: Germany, Andorra, Austria, Belgium, Brunei, Canada, South Korea, Denmark, Spain, USA, Finland, France, Great Britain, Greece, Hong Kong, Ireland, Island, Italy, Japan, Liechtenstein, Luxemburg, Malaysia, Malta, Monaco, Norway, The Netherlands, Portugal, Saint Marine, Singapore, Switzerland, Taiwan y Vatican. - Please, remember that only people that are in perfect health conditions and without any pending legal proceedings will be able to enter Australia. - You will be able to enter Australia until the last day of validity of your ETA and to stay in the country up to a maximum period of three months. - Permanencies longer than three (3) months. - Passengers that wish to stay permanently in Australia. - Passengers that enter to look for an employment. - Passengers that enter to study. - Verify the fulfilment of the general conditions. - Send your data to producto@aerolineas.com.ar, mentioning your booking code. - Wait for the confirmation of said proceeding via e-mail. a) Argentine Republic citizens need a visa to enter the U.S. of North America territory. To Possess biometric passports (e-passport) and be registered (compulsorily) before travelling in the DHS (Department Homeland Security) through the ESTA Program (Electronic System for Travel Authorization). That can be requested through Internet. According to what has been informed by the U. S. Of America Government, the objective of requesting an ESTA (Electronic Visa) is to determine almost immediately whether the person who requests it joins the requirements to apply for the Waiver Program. In case of obtaining it, its validity lasts two (2) years, multiple entries or up to the date of expiration of the deadline of his/her passport, whatever may occur first. In the site, you will have to complete a form entering surname, name, date of birth and place of residence. - Travel Authorized – It is attached to the passport (the authorization validity lasts two (2) years). - Travel NOT Authorized – It will have to be applied to a Visa. - Authorization Pending – Go back to the site within the following seventy-two (72) hours in order to receive a final answer. Important: Those passengers that have a valid Visa for the U.S. of America do not need to carry out any proceeding. Those countries that are part of this program are: Andorra, Australia, Austria, Belgium, Brunei, Denmark, Finland, France, Germany, Island, Ireland, Italy, Japan, Liechtenstein, Luxemburg, Monaco, The Netherlands, New Zealand, Norway, Portugal, Saint Marine, Singapore, Slovenia, Spain, Sweden, Switzerland and England and with an electronic passport, exclusively: South Korea, Lithuania, Stonia, Latvia, Hungary, Czech Republic, Slovakia and Greece. The U. S. of America Department of Homeland Security Of America (DHS) has informed us that since July, 1st, 2009 the emergency and temporary passports of the countries which form part of the Program of Visa Exemption will have to be electronic passports in order to be used in said program. Therefore, since July, 1st, 2009 onwards all the citizens of countries pertaining to the Visa Waiver program that present their emergency or temporary passport, will be able to travel only under the regulation of said program in case the document has an electronic chip. In case the emergency or temporary passport has not the before mentioned electronic chip, the holder of said passport will have to request a visa before travelling to the U. S. of America. All foreigners wishing to enter and/or leave Peru must produce a passport validly issued by a State and which is valid for at least six (6) months as from the date of entry into the national territory. I’ll travel to Bolivia. Do I need any vaccination? 1- Any national or foreign person who enters Bolivian territory and who plans to visit a yellow fever endemic municipality are recommended to have a Yellow Fever vaccination certificate. 2- Those persons who for medical reasons cannot get the Yellow Fever vaccination, are recommended to have the corresponding exemption certificate and take basic preventive measures. The municipalities at risk are: Beni, Pando and some areas of the departments of Chuquisaca, Cochabamba, La Paz, Santa Cruz and Tarija. I’ll travel to Uruguay. Can I enter that country with an electronic passport? Yes. The automatic immigration gate, Easy Airport, has been enabled for all Argentine citizens who enter Uruguay with their electronic passport. I’ll travel to Uruguay. Should I complete a Sworn Declaration for accompanied baggage? Yes, click on this video and you will get information on Uruguay’s regulations on the matter. I’ll travel to Colombia, do I have to meet any medical requirements? As of April 1, 2017, Vaccination Certificate against yellow fever will be required for all passengers entering its territory from the following countries: Brazil, Angola, Uganda, and Republic of Congo. This requirement applies to all passengers coming from the countries mentioned, regardless of their nationality. The vaccination certificate is valid from the tenth day after vaccination. Exempted are only: pregnant women, children under one (1) year of age, people over sixty (60) years of age, who must present a medical certificate attesting their status. Passengers arriving without the medical or vaccination certificate, as appropriate, will not be admitted and returned to their points of origin. Electronic visa to enter Brazil. For Australian citizens who declare to be resident in Australia, an alternative electronic procedure has been implemented to obtain the visa (e-Visa). Parallel, visa application through consular channels remains valid. Once approved, the passenger will receive the e-Visa in a PDF document in his/her e-mail box, must print it and present the printed copy when boarding and before the Immigration Authority upon arrival in Brazil. Boarding will not be allowed if the printed e-visa is not presented. It should be verified that the passport registered on the e-visa is the same as the one used for the trip, otherwise the e-visa will not be valid. The e-Visa will be valid for a maximum period of two (2) years or until the expiration date of the passport, whichever comes first. This visa allows a maximum stay of 90 days per year. - DNI (National Identity Document for its initials in Spanish). As of April 1, the digital DNI will be the only valid document. - Valid Passport of your Nationality. In case you are a holder of a valid Certificate of TEMPORARY Residence, you must submit it together with the valid travel document of your nationality, both to the Exit and the Entrance, to be supervised by the Control Authority. Check-in and/or boarding of a passenger who does not present a valid identity document will not be possible. A report of loss, a birth certificate, etc. will not be accepted as document. The above applies to all Domestic, Regional and International flights. Only applicable on Domestic flights: In the case of a passenger with a return ticket to his/her place of origin, who has suffered the loss and/or theft of his/her document in the period of time between the beginning of the trip and the time of return and submits a police report of loss, it will be tried to identify him/her requesting another type of document that helps in identifying him/her as a genuine passenger and make check-in and boarding possible. In cases of doubt, you should consult with the Station Manager. - Please, show the ticket along with your personal documentation and despatch your baggage through the counter assigned for your flight. - Auto check-in terminals are enabled in the following airports: Aeroparque, Asuncion, Bogota, Brasilia, Caracas, Cordoba, Ezeiza, Rio de Janeiro, Sao Paulo, Lima, Montevideo, Santiago de Chile. - You may do it within the 48 hours before departure of your flight, right at the same airport, at another airport or through Aerolíneas Argentinas offices located at 2 Peru Street in the City of Buenos Aires. - In case you do it on the same day of departure and at the same airport, you may despatch your baggage. - Only passengers with Electronic Ticket can do it, within 36 hours and up to 2 (two) hours before departing time. - Once you have obtained your Boarding Pass, please check out the time and gate where you have to show up. - Passport and authorizations, in case of travelling with minors. Please, check the deadline of the passport in advance and keep in mind that many countries demand that the expiration date is not before six months after your arrival to their territory. Additionally, find out the requirements of the visas as soon as possible. - National Identity Documents ((DNI for its initials in Spanish), green or burgundy cover and light-blue book made by hand), will not be valid as a travel document for leaving the country as of November 1, 2016. - Those cytizens of countries that participate of the Visa Waiver Program (VWP), i.e., that do not need a visa to enter USA, will have to possess a passport which permits electronic reading of the biographical data (MRP-Machine Readable Passport); otherwise, they will need to apply for the consular visa. You may obtain more information through the Migratory and Visas Proceedings from here. - Effective 1st of September 2012 there is a new system for online payment of the 'Reciprocity Fee' to enter the Country for passengers who are Citizens of United States of America, Canada and Australia. The application will show a receipt which must be printed to present at immigration upon arrival in Argentina. - Please, show up the ticket and the requested documentation, complete the migratory card and despatch your baggage through the counter assigned to your flight. - Once you have obtained your boarding pass, you will have to pass through Migration Office showing your personal documentation in order. - Please check the Schedule and the boarding pass which match with your flight and pay attention to calls. To check in online, you should enter your reservation code and your last name as it appears in your reservation. For domestic flights, you can check in online as early as 48 hours and up to 55 minutes before the departure time of your flight. For Regional and International flights, you can check in online as early as 24 hours and up to 70 minutes before the departure time of your flight. What are the routes on which this service is available? It is available for all Aerolíneas Argentinas and Austral origins and destinations, except for the Punta Cana - Buenos Aires segment. Passengers with an e-ticket, and up to 9 passengers per reservation. Who cannot use this service? This service is not available for code-share flights numbered 7000 to 7999 that are operated by another company. Can I choose my seat when checking in online? Yes, you may choose or change your pre-assigned seat during this stage. Can I add my frequent flyer number when using this service? Yes, you may add you frequent flyer membership number when checking in online. What documents do I need at the airport to board? You should have your e-Boarding Pass or check-in confirmation together with a document valid for your trip, according to your destination (ID card, Argentine National Identity Document or Passport). Except for flights where the QR code is not enabled and there is the possibility to print the boarding pass. How early should I show up if I checked in online and do not need to check baggage? 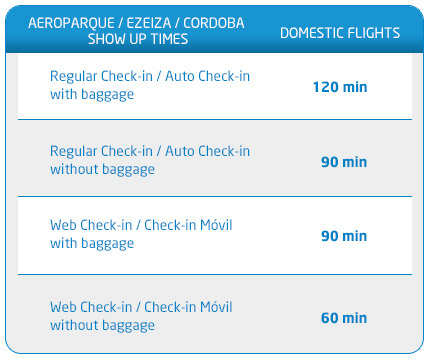 If you are travelling from Aeroparque, Ezeiza or Córdoba in a domestic flight without checked baggage, you should arrive at the counter 60 minutes before the scheduled flight time. If you are travelling from Aeroparque, Ezeiza or Córdoba in a regional or international flight without checked baggage, you should arrive at the counter 90 minutes before the scheduled flight time. If you are travelling from other airports within Argentina (except Córdoba) in a regional or international flight without checked baggage, you should arrive at the counter 75 minutes before the scheduled flight time. If you are travelling from airports outside Argentina without checked baggage, you should arrive at the counter 90 minutes before the scheduled flight time. How early should I show up if I checked in online and have to check my baggage? If you are travelling from Aeroparque, Ezeiza or Córdoba in a domestic flight with checked baggage, you should arrive at the counter 90 minutes before the scheduled flight time. 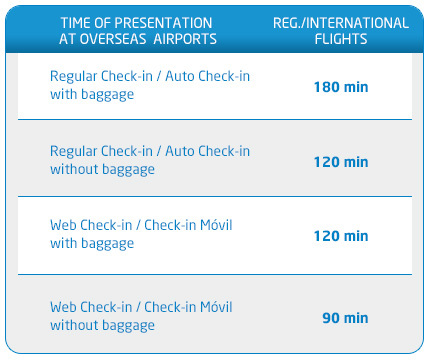 If you are travelling from Aeroparque, Ezeiza or Córdoba in a regional or international flight with checked baggage, you should arrive at the counter 120 minutes before the scheduled flight time. If you are travelling from other airports within Argentina (except Córdoba) in a regional or international flight with checked baggage, you should arrive at the counter 90 minutes before the scheduled flight time. If you are travelling from airports outside Argentina with checked baggage, you should arrive at the counter 120 minutes before the scheduled flight time. Can I board with the QR code on my boarding pass? Yes, you may board with the QR code on the e-boarding pass sent to your e-mail account to and from all our destinations, except from Miami (MIA) and New York (NYC), where you will have to board with the INFOCARD sent to your e-mail account and print the boarding pass at the airport. In your cell phone, you should have the e-mail you received with the e-boarding pass available during all the stages of your trip (check-in, boarding and landing). If your itinerary involves a flight departing from Miami (MIA) or New York (NYC) that does not have this system, you will not receive the e-boarding pass with the QR code but a check-in confirmation detailing that you should print your boarding pass at the airport. Why do I get an error message while checking in online? If you changed the date/route of your flight and the e-ticket has not been reconfirmed, you should contact our Call Center. Check all the information regarding the online Check-in and make sure you always have the e‑mail with the e‑boarding pass with the QR code, or the check-in confirmation available in order to print the boarding pass at the airport. All bookings generated in Argentina at our offices, call center and aerolineas.com currently available, up to 24 hours before the departure of your flight, can be changed . Booking changes generated through travel agencies are not allowed. What changes can be made at aerolineas.com? You can change the date and/or time of your travel. Route changes are not permitted. What should I do if I have a problem when paying the change? Once you reach the page that shows the means of payment you must pay the change because otherwise your reservation will be canceled. If you have any problems when paying for your change, please call our call center at 0810-222-86527 to complete the process within the next 2 hours. Which means of payment can I use to pay the change? The payment method accepted on all websites is credit card or debit card (only in Argentina). Payment through Pago Facil and Pago Mis Cuentas is not permitted. How long do I have to pay the change once it is accepted? You have two hours to make the payment; otherwise, your reservation will be canceled. How can I make the refund of a ticket bought through aerolineas.com? If your ticket has been paid with credit card through aerolineas.com, you will be able to request its refund through the enabled form which appears the aerolineas.com/refund”. The refund should be requested from the same country of residence from where you have made the booking. In case your ticket has been paid through the ”Pago Fácil” or through “Pago Mis Cuentas” options (only applicable in Argentina) the refund should be requested personally through any of our Sales Offices. How can I continue the proceeding after completing the form through aerolineas.com? Once the form has been processed within the following 30 days, you will receive an e-mail with the confirmation and data of the proceeding including the amount to be refunded. Neither a written evidence order number nor a request order number shall be generated. In the event that the refund request does not comply with requirements established or the fare restrictions do not permit it, you will receive an e-mail with the corresponding explanation as regards the case. How and in how many terms the refund is credited? Once you receive the confirmation of the refund by e-mail, you will be able to see the amount credited in your credit card statement in the term of 90 days. In the event that I have paid in installments, how the refund is credited? The refund shall be credited in only one payment. Meanwhile, you will go on receiving in your statement the installments that are left of the chosen financing option at the moment of the purchase. If it was an Aerolíneas Plus reward ticket, how do I ask for the refund? In case your ticket has been exchanged for Aerolíneas Plus miles, partially or in its entirety and the class of fare permits to make its refund, you should ask for it personally through any of our Sales Offices, taking into account that you will have to pay the corresponding Aerolíneas Plus fee. Which is the Schedule for Customary Service at Aeroparque? The Schedule for public customer service at Aeroparque is from Mondays to Sundays, 24 hours a day. The Schedule to answer phone requests is from Mondays to Fridays from 9:00 AM to 6:00 PM. How must I present the goods to be delivered and which data must I provide at the moment of dispatching it? Dispatches shall be accepted whenever they are presented with the appropriate packaging, respecting the Capacity, Weight and Usage of the goods to be transported, properly closed and labeled with both the sender and the addressee complete data. Are the conditions of shipping same for the whole country? No shipments to / from the towns of Ushuaia and Rio Grande offers Customs intervention, please consult your local Customs, schedules and costs. How can I pay the dispatch? The company accepts payments in cash, with debit card or credit card. Likewise, the company offers the collection service of freight at the destination; please contact us to ask about restrictions and overcharges due to the service. We also offer the companies a current account to make the sending habitually. Is there a limit as regards kilos to be dispatched? Although we have no limitation as regards the quantity of kilos to be dispatched, we will accept packages a maximum weight of 90 kg. each. What documentation must I show to dispatch or withdraw the goods? The documentation to withdraw the goods are, DNI, CI, LE, LC from physical persons and a headed notepaper signed and sealed by a responsible person from the company as regards legal persons, where there must appear the name, the last name, and the ID card number of the authorized person to withdraw the goods. JET PACK accepts annual authorizations, being the issuing company the one in charge to report any modification. Can I transfer coffins by air? Yes, it is possible to transport coffins by plane. What certificates must I submit for such dispatch? The person will have to submit a Death Certificate or a medical certificate stating that the cause of death has not been produced by a disease infectious-contagious. The transportation of persons who died from this cause is forbidden. There will be necessary that the person presents the before mentioned certificate with a signature, a seal and the registration number of the professional responsible party acting in the Ministry of Health for their certification. Transfer Certificate issued by the Director of Cemeteries of the place where the death occurred. Certificate of Practice of Thanatopraxy. (Embalming). Affidavit of packaging issued by the funeral home, stating that the body is placed in a crypt, completely welded and conditioned for the transportation by plane with gas-drain valve. Certificate of death issued by the Home Ministry. Visa from the Consulate of the destination country. Apostille issued by the Ministry of Foreign Affairs. Certificate of lading issued by the Office of Border Health (located at the International Airport of Ezeiza or Aeroparque). Note: You should consult with the Embassy of the destination country in order to verify the requirements. Which the adequate overpack would be for the transportation? The coffin must be placed within a wooden formwork to help camouflage its content. A label must be obligatorily adhered to the packaging where the complete data of the sender and of the receiver appears clearly written. Can I transport the ashes of a member of my family? Yes, it is possible to send the ashes by plane. What documentation must I submit? Ezeiza or at Aeroparque Jorge Newbery), with which it will be permitted to go out of the country. a) - Certificate of Death (the original and a copy). b) - Certificate of the Crematory (the original and a copy). c) – ID Card of the person who is handling the procedure (the original and a legalized photocopy of all the three first pages). d) – If the person travels, the photocopy of the air ticket. Once the Certificate has been obtained, the export proceeding shall be fulfilled at the Argentine Customs Office. Which the necessary packaging for the casket would be? The casket must have a packaging which can help camouflage its content. Is it possible to make a move through Aerolíneas Cargo? Aerolíneas Cargo is an excellent alternative to make your move be on time and in perfect conditions to its final destination. • Transportation of your furniture and personal objects from one airport to the other. • It does not include packaging of the articles to be transported. • It does not include the procedure for getting the necessary documentation for the transportation. What documentation must I submit to make the move? Moves can be performed by individual people who can prove their situation through a written evidence issued by the Consulate of your destination country. - A legalized photocopy of all the Passport pages, including the ones in blank. - A legalized photocopy of the air ticket. - A written note informing the content in detail. Which would be the procedure I have to make? You must present a letter of the Consulate of the destination country, indicating that you are making a Move. Depending on the current rules, your belongings can be exempted from taxes with the support of this documentation. You must bring a list detailing the totality of properties you wish to transport. Approximately one week in advance before the date on which you wish to transport your properties, you must consult with the Office of Delivery of Cargo de Aerolíneas Cargo in order to coordinate day and schedule for your presentation. Is it possible to perform the transportation of my pet through Aerolíneas Cargo? Aerolíneas Cargo has a wide and well-known experience as regards the transportation of pets, worrying about all the details to assure that they arrive at their destination in optimal conditions. There exist several requirements that you must comply with in order to make the shipment of live animals, depending on whether the flight is a national or international one, which must be confirmed at any of the Aerolíneas Cargo offices. Which are the requirements for the boarding of Pets as Cargo through Aerolíneas Cargo (in domestic flights)? Documentation is not required for domestic transportation, with the exception of the health certificates when necessary or the certificate issued by a veterinarian when the animal are less than twelve (12) weeks stating that they can be transported due to their small size, especially in the case of those breeds that are more susceptible to dehydration. Pet must have been weaned and at least to be two (2) months as a minimum of age. Does Aerolíneas Cargo provide of cages? No, the client himself/herself must bring the adequate cage for the transportation of his/her pet. Which are the characteristics that the cages must have? • It should permit the animal to be standing with its head normally erected. • It should allow the animal to lie fully extended. • It should permit the animal to turn around into the cage. • The vent holes of the cage must occupy at least one third of the superior surface. Meanwhile, the front door must be made of sweeps or of mesh entirely to produce the circulation of the air and allow the animal to breathe more easily. • It must be provided with bird baths for water. What documentation is necessary to be submitted? You must submit a certificate of a veterinarian issued during the previous ten (10) days before the flight departure that evidences the good health of the pet, that it has received the corresponding rabies vaccines and that these are now in force. You have to submit a plant health certificate issued by the Agricultural and Cattle Service in case the corresponding Customs Office requires it. You have to verify with the Embassy of the destination country in Argentina, the sanitary or customs documentation required by the destination country. It is responsibility of the client to comply with these and with any other requirement that applies for the private transportation in the place of boarding and at the destination. What must I do the day of the flight? Feed your pet before leaving home to go to the airport. Bring a diaper or any other absorbent material on the floor of the cage to dispel the animal excretas. Drugs and the altitude are not an advisable mixture. If a veterinarian advises a dose de tranquilizer, you must glue a certificate to the container which indicates the following: scientific name of the applied drug, administered quantity, time of said administration and length. The cage must have a container a pot for watering the pet, fixed to the container that cannot tip liquids and that can be filled from outside. You must coordinate the presentation of the animal for the flight with AEROLINEAS CARGO. A. Verify that your pet complies with all the requirements before mentioned to be transported. B. Weight your pet and measure its cage dimensions. C. Issue an air waybill. D. Collect due to the service. * Valid Information for shipments from Argentine Republic. At what temperature will travel my pet? Your pet will fly at a room temperature, comfortable for the animal, during the whole routing. How long will last the delivery of my pet at destination? You must coordinate with the receiver of the pet and inform him/her about the arrival time of the flight, so the clearance by the customs authority takes place as soon as possible so the pet waits the shortest possible time. Which are the requisites for Boarding Pets as Cargo through Aerolíneas Cargo (international flights)? An international vet certificate issued by the SENASA (in Spanish, Servicio Nacional de Sanidad y Calidad Agroalimentaria, what is the equivalent to “National Health Service and Food Quality” in English) (Lazaretto). Fotocopia del todo el pasaporte o fotocopia de las primeras 3 hojas del DNI legalizadas por escribano. Photocopy of the entire passport or photocopy of the first three (3) pages of the D.N.I. (ID card) certified by a notary public. In the case of sending the pet to SYDNEY, please consult with our company and with the Consulate. Can I transport mobile phones or notebooks that contain lithium batteries by plane? YES, it is possible respecting certain rules and restrictions established by the Aerolíneas Group. Which are the lithium batteries accepted by Aerolíneas Cargo? b) Batteries of lithium metal (including batteries of lithium alloy): This name involves to the batteries of lithium metal, frequently non-refillable. They are used in computers, which once supplied its energy, the battery is disposable. The risk is measured by the number of grams of lithium metal that has each battery. Lithium Ion Batteries do not have to overcome the 20 Wh of energy burden. Lithium Ion Batteries do not have to overcome the 100 Wh of energy burden. The metal Lithium Batteries do not have to overcome 1 (one) gram Lithium metal. The Lithium metal batteries do not have to overcome the 2 (two) grams of lithium metal. How should they be presented for the shipment? Lithium Ion batteries, as well as those of lithium metal, for its dispatch, can be under three characteristics. a) Shipment of batteries only, i.e. without any electronic equipment in its packaging. Under this characteristic, there exist two modalities of shipment. b) Shipment of batteries packaged with an equipment, that is to say, batteries not installed on your computer, together with this in the same packaging (example: pack of sale of a mobile phone). c) Shipment of cells or batteries contained in a computer that is installed on your computer. These packing instructions are regulated by the Manual of IATA Dangerous Goods. You may ask our operators with respect to it. What documentation must be attached to these types of shipments? This Statement is provided by the Aerolíneas Group at the request of the consignor. In this document, the Consignor shall indicate what the condition of its boarding is marking with an “X” ; indicating thus, the Number of United Nations of its good, the Instruction of the corresponding Packaging and the applied section and the type of element that is intended to carry. It will have to indicate a twenty-four attention telephone at any requirement of information during the transportation. Said document will have to be dated and signed by the consignor or his/her Agent. The Consignor can submit as an alternative to the Statement of Boarding of Lithium Batteries, a MSDS (Security Worksheet), Technical Data Sheet or Entrepreneur Note duly signed by a responsible of the shipment. It is essential that the data required in the Statement appears in the before mentioned writings, for the correct classification of the Lithium batteries to be carried (ONU number – Packaging Instruction – Applicable Section). How must they be packaged? The packages of these goods require that they are subject to the Condition CPU (Capacity, Weight and Usage), applicable to the exterior packages, as well as to the over packs. The Batteries shall be of that type which complies with the requirements of each test established in the Manual of Tests and Criteria, Part III, sub Section 38.3 of the United Nations. The packaging must not contain waste material of any Battery in general of from Lithium Batteries and can not contain Batteries which has been withdrawn from the Market and / or defective. The Batteries must be protected to prevent from short circuits, as well as include protection against all contact with conductive material within the same packaging which could cause short circuits. In the packaging containing equipment, these will have to be subject to avoid movements within the outer packaging and packed in such a way that an accidental operation during the transportation could be avoided. What should be the marks and labeling? The packages should be marked according to the indications of the Regulations. Besides, they should bear labels according to the characteristics of the shipment. In the shipments that apply IB Section of the Packaging Instruction 965 (nine hundred and sixty-five) or 968 (nine hundred and sixty-eight), the outer packaging will have to show the Class 9 (nine) Label of risk and the one about Handling of Lithium Batteries. On the other hand, the shipments that apply II Section of the Instructions of Packaging 965 (nine hundred and sixty-five) to 970 (nine hundred and seventy), will have to evidence the Label of Handling of Lithium Batteries (except those packages with Batteries (with the exception of packages with batteries contained in computers in a number less than or equal to 4 or 2 batteries per package, do not require handling label for lithium-ion batteries). Packages must be marked with a 24-four hour’s attention telephone a day to get any information about the shipment, during transport. Is it required to make the D.G.D. (Statement of the Consignor)? Yes, it is necessary to submit the Statement of the Consignor. How can I proceed in case I send only one equipment new or equipment in use? a) The Cargo Commercial agent, shall evaluate the type of batteries (Litium Ion or Lithium Metal), observing that the batteries are subject to the parameters permitted. b) For the case of shipment of an Equipment in use, the batteries will NOT be installed in the equipment, but packed together with it. Those batteries should be protected to avoid short circuits to occur; apart from having a protection in front of the contact with conductive materials within the same package that could cause short circuit. c) In the shipments of a New Equipment, which package has never been opened or verified that sales conditions are maintained, that is to say, that the batteries are not installed in the equipment. Otherwise, you will have to proceed as if the equipment were in use. The package must be marked as: “Equipment with Lithium Battery, excepted”. The package must have a Handling Label for Lithium Batteries. The package must exhibit a 24 hours attention telephone. The package may not exceed 5 kg. of net weight. e) In the air waybill, it must be declared as “Equipment with Lithium Batteries, excepted” in the Nature and Quantity of Goods Box. *Valid Information for shipments from Argentine Republic. Where should I start the claim whenever I realized that there is any missing object and/or breakage in my baggage? Upon detecting a missing and / or damaged baggage you must introduce yourself to our staff in the arrivals hall to make the Baggage Irregularity Report (PIR). Remember that all baggage claim must be made in the field of airport and before retiring it, because otherwise it is considered that the luggage was received accordingly. How can I continue with the proceeding initiated about my claim? In the event that the breakage of your baggage which hampers the baggage from its transportation, please request some member of our staff at the customer service section at the airport to initiate the proceeding to be followed; in case of some element of the content lacking, please send an e-mail to reclamos.equipajes@aerolineas.com.ar, informing about the fact occurred, adding to it the detailed information and the value of said elements manifested as missing and attaching to it the luggage ticket, boarding pass, your identity document. Is it convenient to transport fragile elements, bottles and perishable elements within your baggage? Fragile items, bottles and perishable items should not be included inside luggage as they may cause damage to third parties. Can I include elements such as jewelry, money, electronic devices, medicines, keys or documentation within my baggage? You may transport those elements and under your own safekeeping due to the fact that there were damage or loss the company shall indemnify you within the legal limits established. How can I act in case my baggage has not arrived to destination? When detecting that your baggage has not arrived to its destination, please contact any member of our staff located at the arrival hall who will proceed to enter your baggage data in the World Tracer System with the purpose of making the Property Irregularity Report (PIR). This system is used by the majority of the airlines granting a high reliability as regards the location of your baggage. Once they have located my baggage, from where must I remove it? Whenever your baggage have been recovered, it shall be sent to the domicile you have informed timely free of charge.